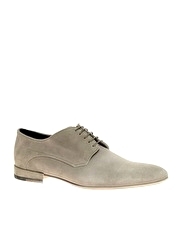 Produktbeskrivning för HUGO By Hugo Boss Prayor Suede Derby Shoes: Suede Derby shoes from HUGO by Hugo Boss . Featuring a lightly worn finish with natural discolouration and fading, a lace up closure, a side and back panel with squared-off top stitching and a low stacked block heel with suede panelling and contrast insert detailing. ABOUT HUGO Progressive, creative and individual, HUGO by Hugo Boss specialise in directional mens clothing with a timeless appeal. With Hugo Bosss inimitable style at its core HUGO offers forward thinking menswear in the form of tailored suits and shirts, knitwear and accessories. Ansök om lån för finansiering av valfri vara eller tjänst.